Proprietor of Trophy Stall Ramesh Sunich (right) presents one of the trophies to be competed for to Narchand Mohan. compete for the Mohan Memorial Cup four-team Under-19 cricket tournament, slated for the C-3 Park, Cricket ground Cotton Tree, West Bank, Berbice. The competition is being held as part of the efforts to resuscitate the Hawaiian Arctic Cricket Club (HACC) in Guyana which was formed in conjunction with the Hawaiian Arctic Cricket Club (HACC), in Toronto, Canada by long-standing president, Narchand “Archie” Mohan. The (HACC) was formed more than 20 years ago in Canada, while the youth club was also simultaneously established here at Mohan’s home village, Cotton Tree, West Coast Berbice. However, the club in Guyana was hardly functioning up to date for some time, thus the effort to have it resuscitated. The initiative to revive the youth club was spurred by the parent club’s consistent success in Canada where it won the Scarborough Cricket Association (SCA) Premiere League tournament in Canada for six consecutive years. Mohan felt that the same success could be achieved here. The teams expected to be in action are HACC under-19, Blairmont Blazers, De Edward and Achievers of West Berbice. Several trophies and cash incentives will be up for grabs, including man-of-the-match in the final and other outstanding players. 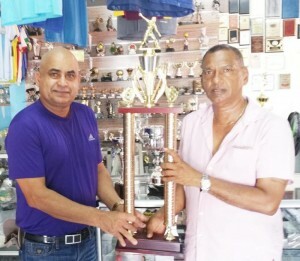 On Saturday last, proprietor of Trophy Stall, Ramesh Sunich handed over the trophies, which are to be contested for, to Mohan at the company’s South Road, Bourda Street, premises.